Another installment of “Underworld” is coming out, and I’m obligated to hope it does well. Not as a fan of the series, but as a fan of werewolves. Why? Because Hollywood won’t see its success or failure as Here’s what people think about Underworld. Instead, it will be viewed as Here’s what people think about werewolves. So, if I want to see more lycanthropy up on screen, I must hope for the success of this film. As a writer, the concept of the werewolf fascinates me. It is man’s feral nature, bursting forth and coming to a clash with the civilized world. In short, the werewolf is the id. The concept is nearly limitless, and still has much room for exploration. As a fan, the werewolf story is essentially a superhero tale. It’s the same story as Spiderman. Bitten by an otherworldly force, a nobody is suddenly thrust to find if they are either gifted or cursed. It’s the story of someone who has something missing within them, suddenly being given more than they can handle. 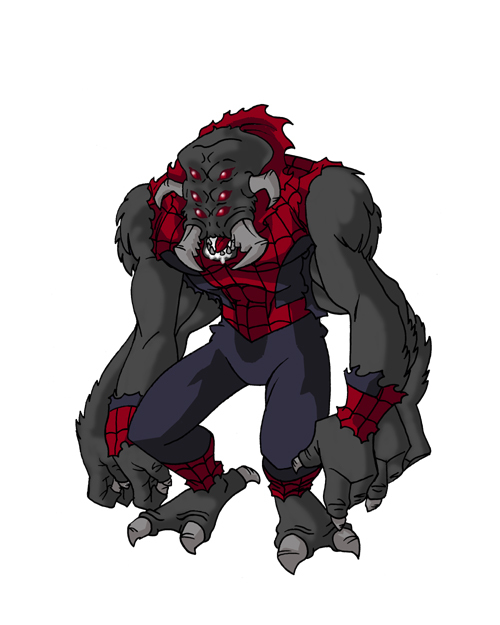 Indeed, in one timeline of Spiderman, he even begins turning into a werespider, if you will. The werewolf has yet to have its day. Vampires are in vogue and idealized, but I think the comparison is an irrelevant invention of pop culture. It’d be like if Frankenstein vs The Mummy had taken off, and now all mentions of Frankenstein’s Monster must be held up against King Tut. Having said that, I think I’ve written something that will do for werewolves what Anne Rice did for vampires. I hope to share it with you soon. I absolutely love werewolves! They are one of my favorite supernatural creatures, and the book I’m working on now actually deals with werewolf-like creatures (I say “like” because I do take some liberties on tradition, so I never actually refer to them as “werewolves” in the story). Hope everything goes well with your novel. Sounds like something I’d love to read. Good luck!